Neuron VS's main screen, showing the two Resynators, Blender, and Shapers (envelope generators). The colour coding of the two X-Y controllers indicates which of the three parameter levels is being accessed. If you pined after the innovative Neuron in 2003, but couldn't afford the £3500 price tag, check out Neuron VS; it packs most of the original synth engine into a £500 software instrument and throws in a distinctive hardware controller. Actually, it's perhaps not surprising that Hartmann have made this move: as was noted in the August 2003 SOS review of the original keyboard, Neuron is based on a PC architecture, and one of its main developers is also the man behind German software house Prosoniq, which must have made developing the plug-in easier. Whatever the motivation, software has to be a more economical option for a developer, even if, as in the case of Neuron VS, the software comes with a hardware controller. Tooling up for a rack Neuron, on the other hand, would have produced another mega-thousand-pound product. The original Neuron created quite a stir when it was announced by promising a new approach to synthesis and sound creation, and anyone who heard one, as I did while attending the Frankfurt Music Fair during its launch year, couldn't ignore the range and volume of sounds it produced. I was continuously reminded of the Neuron's impact as it swooped and roared in the background of an interview that I recorded at that show. Now the attractive concept of running that technology from your computer desktop has created a stir of its own. The Neuron VS package consists of two parts, one hardware and one software (as this review was approaching completion, a second software component, Modelmaker, was added to the bundle — see the boxout for more on this). 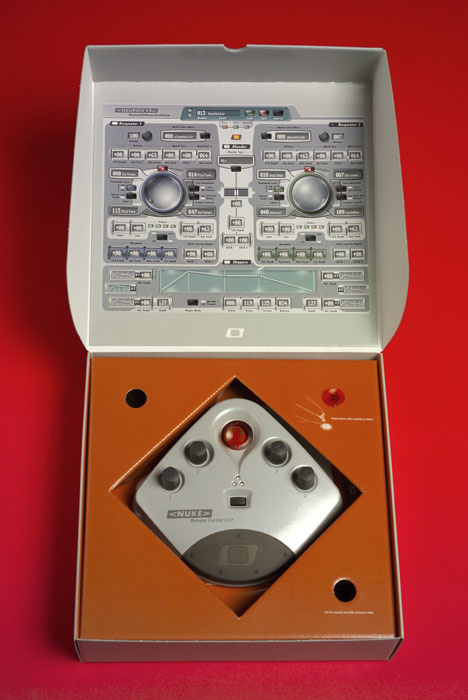 The hardware element is the USB-driven Nuke remote control unit, which offers a single stick controller — the X-Y joystick, of which there are four on the original Neuron keyboard — and four assignable continuous controllers. Neuron VS, the software component, is essentially the synth engine from the original Neuron in plug-in form. Obviously, the keyboard version has the advantage of its own dedicated hardware, so its performance is not dependent on the power of your CPU or the amount of RAM you have installed, as is the case with Neuron VS. The keyboard version also offers surround-sound audio compatibility, future plans for audio-input processing and four-part multitimbrality. But the rest remains largely the same. For the benefit of those unfamiliar with the original, a quick recap is in order. 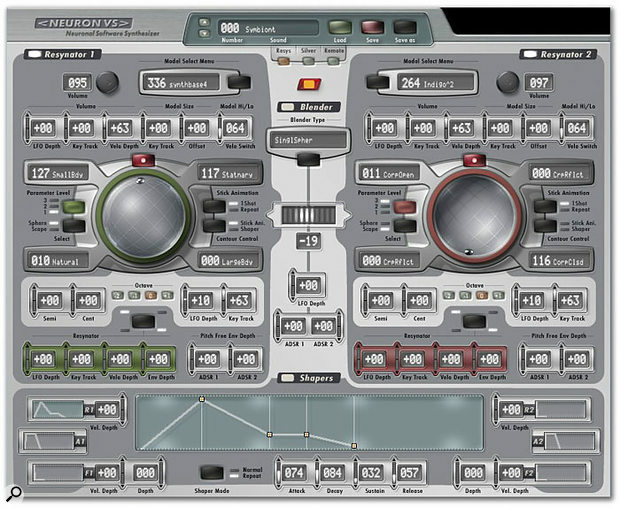 Although samples play a role in creating the sounds that the Neuron generates, its synth engine is not based on straightforward sample playback, nor does it utilise physical-modelling or granular-synthesis techniques. Instead, samples are analysed to create a flexible model of the original sample or sample set. On playback, the user is presented with control over various sonic elements of the resynthesized model, broadly arranged into two categories which Hartmann call 'Scape' and 'Sphere'. The company's explanation of these categories is that Scape parameters concern themselves with control of the sonic elements involved in initiating a sound, while the Sphere parameters relate to the aspects that shape how the sound develops over time. Despite this distinction, it's fair to say that it's not always clear what the parameters control. Although many parameters in Neuron VS have generally comprehensible names — Warm, Cold, Tubular, and Planar are good examples — some are more cryptic, especially in an audio context. It might have helped if Hartmann had summarised the model parameters that can arise, as each model has a different set. But the unfamiliar terminology encourages experimentation that is often rewarding, and even if you don't have an immediate sense of how a sound is created, this doesn't have to be a problem — if a synth sounds good, a detailed understanding of the maths that drives it isn't always essential. What's more, being forced to learn how to interact with an instrument in an organic way is an experience that's all too uncommon with modern hi-tech music hardware and software, and one that can lead to a better, more personal understanding of an instrument. 850MHz Pentium III (or compatible) with 256MB of RAM and 44.1kHz, 16-bit stereo audio hardware running Windows XP and a VST 2-capable host application, with 2GB of hard disk space (minimum); 2GHz+ Pentium 4 PC with 512MB of RAM (recommended). 1GHz G4 with 256MB of RAM running Mac OS 10.3 or higher and a VST 2- or Audio Units-capable host application (minimum); faster than 1GHz G5 with 512MB of RAM (recommended). Having said all that, if one looks past Hartmann's terminology, it is possible to comprehend the signal path of Neuron VS in terms that are familiar to most SOS readers: the oscillator/filter/envelope generator/LFO structure of the typical analogue-style synth. When you first fire up the plug-in, you find yourself in the Resynator window (shown right). The first things that catch your eye are two large globe-like structures, one for each of the synth's two Resynators. These take the place occupied by oscillators in more conventional synths, and respond to movements of the X-Y stick controller found on the Nuke remote. Each Resynator has four parameter-editing windows ranged around it, and these provide the first stage in manipulating all the sonic elements the modelling process has derived from the samples used to construct the currently active model. Neuron VS has 512 slots for models, 341 of which are filled by Hartmann (1000 patch memories which use different combinations of these models are also provided, with 351 filled). When you load a model into one or both Resynators via the selection menu at the top of the window, a number of parameters become available for editing. Perhaps the most important are the active four around the Resynator, as the Resynator's overall output depends on the position of the joystick. As you move it, you manipulate the active model, highlighting or repressing certain aspects of the sound. This vector-synthesis-like control over the four parameters is at once intuitive, unpredictable and satisfying. A switch to the left of the Resynators toggles the four vector parameters between the Scape and Sphere parameters for the currently loaded model, and there are three levels of parameters for each stick, meaning that 12 Scape and 12 Sphere parameters are available for editing at any one time. On the original Neuron, stick movements could be recorded as part of a sound, and played back in one-shot or looped mode. This feature is clearly planned for Neuron VS — the selection switch to enable it is located to the right of the Resynators, and its operation is described in the VS manual — but sadly, it is not yet working in this version of the plug-in. Moving on, each Resynator has an array of more readily comprehensible modulation routing, velocity and keyboard-tracking options located below it. And below these are the Shapers — or ADSR envelope generators to you and me. Each Resynator has three of these, two of which are under velocity control, and between them, they can govern amplitude, pitch and other parameters. Best of all, they can be looped, which is great when working with longer, evolving textures. All Shaper editing is done on the main display at the bottom of the Neuron VS window; to access one for editing here, you click on the smaller displays at the sides, which show the curves for each Shaper in miniature. Between the two Resynators is the Blender, which can function as a simple mixer or complex cross-modulation matrix, depending on what you want to achieve. Perhaps as much as the models themselves, the Blender has a lot to do with the finished Neuron sound, and is capable of doing some seriously strange things to your models. By way of example, you can switch the Scape and Sphere elements of the models used by the two Resynators, or split both Scapes into complementary or opposing frequency bands and then cross-modulate them, if you want to! Controller assignments are made to Nuke's continuous encoders on the Remote page. A range of standard incoming MIDI controllers can also be routed to the software here, though all the software's parameters respond to a fixed range of MIDI continuous controllers. How the various controls on Nuke function depend on which Neuron VS element they're assigned to. A little button switches between three modes (a trio of LEDs keeps you informed as to which mode you're in), so that the joystick operates either one of the two on-screen X-Y Resynator controllers, or the X-Y controller assigned to the Silver filter module. The four knobs are completely re-assignable (via the separate Neuron VS screen shown above), although they don't have a different set of assignments in each of the Resynators' three parameter levels. In practice, operating Nuke is a satisfying experience. Once you get over the initial feel of the joystick, you soon find that it fits really nicely under a finger, and operates smoothly. How well the parameters on screen respond depends on the complexity of the model at the heart of the current patch, and how well your computer is doing under the load! The experience would have been even more satisfying had Hartmann provided some way to switch between the three parameter levels of each Resynator — the X-Y controller operates differently for each level. 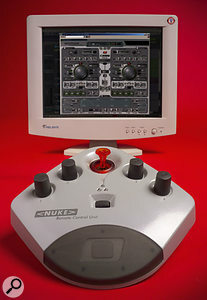 The Nuke doesn't currently interact with software other than Neuron VS, which is a shame — it would be fun to use as an assignable controller for other software. Something for a future update, perhaps? The remainder of Neuron VS 's signal path is controlled on the next page of the plug-in (shown on page 36). Hartmann rather obliquely call this 'Silver', but in terms that the rest of us can understand, this is where you'll find the resonant filter, LFO, and a handful of effects processors. Another on-screen X-Y controller dominates the visual field, and again it can address three different parameter levels. At the heart of this window is the resonant filter: 24dB, 12dB, and 6dB low-pass, 6dB high-pass and band-pass characteristics are available, with Cutoff and Resonance controls. Keyboard tracking can be applied, and the main LFO can also be routed to cutoff frequency. The filter has its own dedicated ADSR Shaper, with a great display and the same repeating and velocity-controllable depth options as the other Shapers. This window is also the home of Mod, Neuron VS 's LFO. It's not sync'able to MIDI Clock, but it has just about everything else. Depth, Rate and Delay parameters are joined by no fewer than 12 waveform types. In fact, LFOs can be routed to so many parts of Neuron VS that it's a shame that there's only one! Having said that, the Slicer module, also found on the Silver page, is essentially an LFO: it has the same selection of waveform types, depth and speed controls, but is hard-wired to the synth's audio. Slicer has two operational modes which Hartmann call Vertical and 3D operation. In the original Neuron review, these processes were accurately described as a kind of tremolo and chorussy tremolo respectively. In addition to this added sense of movement, the 3D option (which admittedly has more of a raison d'être on the surround-equipped Neuron keyboard) modulates audio in strange ways across the stereo field; at low rate and depth settings, the effect is rather like a very animated chorus, but without any of that effect's tendency to obscure. The Silver page lays out VS's filter, LFO, Slicer, frequency-based effects and time-based effects. 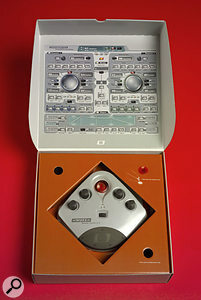 Another EG — Shaper — is provided for the filter, and colour coding again indicates three levels of control for the X-Y controller. Last, but definitely not least are the VS 's two effects processors. The frequency-based effects module, 'Freq FX', offers a choice of an EQ/compressor, distortion module, ring modulator, decimator and the curiously titled 'SP Warp'. The editable parameters are different for each effect, so the parameters on the display change according to your choice. If these effects seem mostly straightforward, it must be said that they sound excellent. And there are a couple of points of particular note; the ring modulator offers a choice of waveforms, and then there's SP Warp. This is one of the strangest, yet most satisfying modulation effects I've heard. It feels like an LFO mixed with a ring modulator, but can be tamed to produce some subtle spectral shifts; untamed, its wild modulations wouldn't be out of place on a 1950s Radiophonic Workshop sci-fi soundtrack. I do have one regret here, though; none of the effects that have a modulation or delay element can be sync'ed to MIDI Clock. 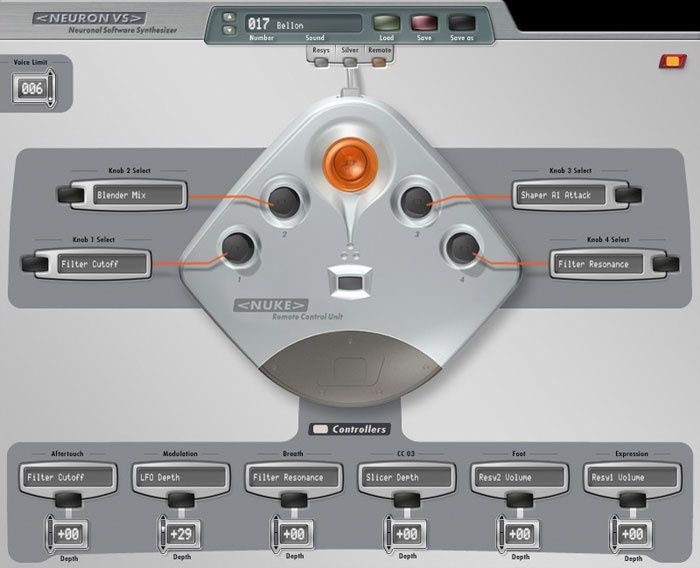 The other effects processor, 'Time FX', handles the time-based effects, as its name suggests. There's a stereo-width enhancer, a left/right delay, a flanger, a phaser and a chorus. But the major selling point relating to both effects processors and the filter is that their operation can be controlled by the X-Y joystick; so you can modulate a left/right delay with it, or satisfyingly use it to negotiate a filter sweep. Once again, controls relating to stick animation are visible on screen, but as in the Resynator window, the function is currently inoperative. Neuron VS has the potential to offer a deep and highly complex programming experience, but I'd say it's been made pretty comprehensible by the Hartmann team. In some ways, the plug-in seems easier to use than its hardware predecessor; it might lack the tactile response of the Neuron's multiple joysticks and knobs, but you do get to 'see' your patch more clearly on screen. The only barrier, once again, is Hartmann's penchant for confusing terminology. 'Cutoff' or 'Resonance' may be abstract parameters, but they're terms that people can understand — especially anyone familiar with even a few synthesis basics. Hartmann's terms like 'cavity' or 'metallicity' are not as readily comprehensible. I did love having a paper manual, though, even if it's not the clearest example. Installation of this software is simple: the cross-platform program disk has Mac OS and Windows XP installers, and the factory model and sound collection is housed on a DVD. You're prompted what to do during installation in order to get the models copied to your hard drive. Note that the software will not run without the Nuke controller/dongle attached via USB, and that an additional software widget to allow this to happen must be installed on your PC. At some point during the installation process, a serial number will be requested: you'll find it on the underside of the Nuke. Note that it's best, if possible, to have a dedicated USB port for Nuke, since the controller can be a bit fussy about working with USB hubs. Whether you're using a Mac or a PC, the first thing that you'll notice when you launch Neuron VS is that it uses up a lot of CPU overhead. A lot. There are ways of keeping this drain to a minimum — reducing polyphony, turning unused elements off, tweaking the plug-in host's audio settings — but the fact is that most of us will hear crackles and drop-outs at some point. If you have a cutting-edge computer and loads of RAM, this may be the case less often, and such a system will have more overhead to respond more willingly to the fine-tuning process. I tried Neuron VS running under both Cubase SX2 and Sonar 4, and I had to deal with more undesireable artefacts than I'm used to on my 3GHz Pentium 4 laptop; I had to adjust latency and other audio system parameters to unacceptable levels in order to get some complex sounds to play without shutting down the audio entirely. Still, the plug-in loaded well in both hosts, with full integration. I wasn't able to try this plug-in properly on a Mac: VS did install on my 450MHz G4, but I could almost hear my host software laughing hopelessly as it tried to run it. Hartmann's minimum spec is true — 1GHz is the absolute minimum speed for Mac use. Neuron VS lacks a number of features available on the keyboard Neuron. Multi-channel sound output is one, and multitimbrality is another. Of course, one could theoretically launch two or more instances of the plug-in, but given its demanding nature, this probably won't be possible — I certainly couldn't run more than one. A better solution would be to create parts and print them to audio as a work progresses. Parts then could be reworked and re-recorded one by one later on if necessary, although I say that in the full knowledge that a single VS sound could be dense and moving enough to dominate a whole track on its own! If you bought Neuron VS as soon as it was released, your first question might well have been: How can I make my own models? 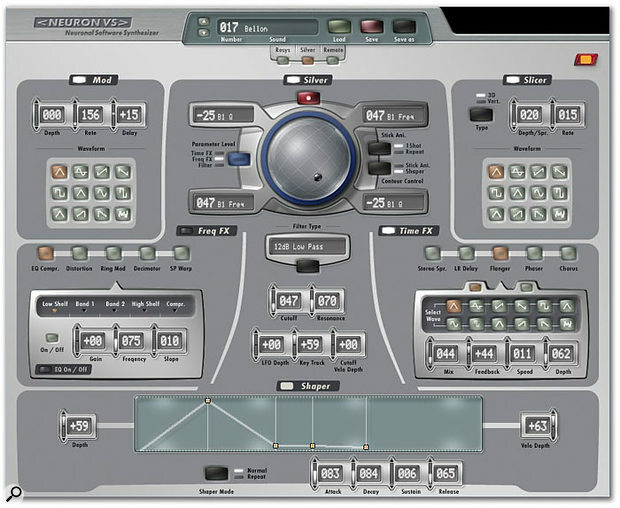 Well, just as I was finishing this review, Hartmann's Modelmaker software for the original Neuron keyboard became available in a version for Neuron VS. It's a cross-platform application, and even runs under Mac OS 9 (though Neuron VS doesn't). It's currently a free download for registered users, but should be bundled with the software in future packages. 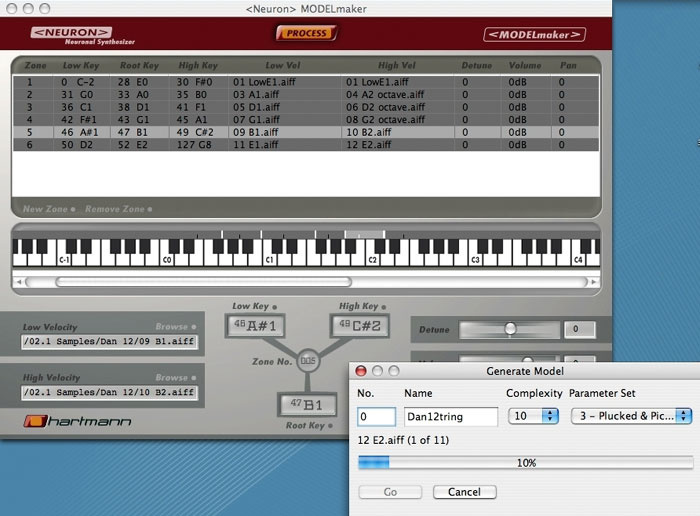 The software allows you to process any sample you like in order to provide Neuron VS with additional models. Currently, though, only mono, 44.1kHz, 16-bit AIFF files can be loaded. Mac and PC users should have no problem finding a tool that will make any necessary conversions if your samples don't fit this description. Hartmann's Modelmaker software now works with Neuron VS. Here it's shown in the process of generating a model from a group of samples under Mac OS X.
Modelmaker is actually a Java applet, which makes it easily transportable from platform to platform. It's also a little non-standard in operation; for example, the file browser is a bit clunky, making finding samples and so on a little more long-winded than strictly necessary. But once you're past this issue, the application works reliably. Other similarly cutting-edge instruments and software simply don't allow users to add their own material. The process is straightforward: you can load samples singly or en masse, and assign them to keygroups; the software can even do this automatically if the right data has been saved with the samples. You have an option to save a high-velocity and low-velocity sample for each keygroup (you have to, actually, so you need to load the same sample for both slots if you don't want to use two different samples). If you then press the 'Process' button, a window pops up: first, you choose a 'Complexity' from 1 to 10, which determines how closely the samples are analysed during the model-making process (the higher the Complexity settings, the longer the process takes). The other choice you make here before Modelmaker starts work is the 'Parameter Set', which allows you to influence what the model ends up sounding like by telling the software something about the type of sounds you're feeding it. 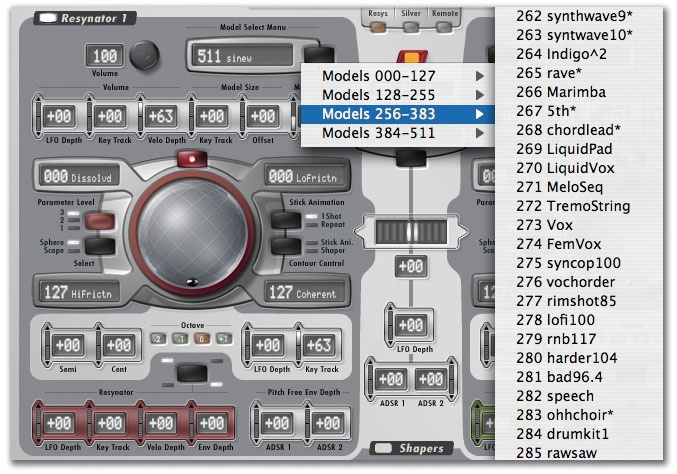 There are 10 Parameter Sets in total (the choices including the likes of 'Stringed/Bowed', 'Plucked & Picked', 'Woodwind', and 'Extreme Pads'), and each results in Modelmaker analysing the source samples in a different way. Of course, you don't have to choose Parameter Sets that describe your samples here; if you wish, you can deliberately choose inappropriate Parameter Sets to produce different models from the same raw samples if you wish. Be aware, however, that the processing can be very CPU-intensive. It's possible to load a lot of samples, and the more you load, the longer the processing time will be. Naturally, the age of your computer also affects this. My aging 450MHz Mac took a long time to process the same pair of non-demanding samples that took a minute or so on my 3GHz PC. In one test I performed on a single sample with a Complexity setting of '1', the modelling process took 12 seconds on my PC, but over two minutes on my Mac. This would, of course, be much faster on a more capable Mac! One brow-furrowing issue is that the software has all its original Neuron-related parameters, such as the option that allows you to transfer a model to the keyboard. That obviously doesn't work with Neuron VS, but nor does the documentation tell you how to get new models into the VS plug-in. In practice, Modelmaker creates a folder containing your new model, which has to be placed in a specific directory, Neuron DB, which is created when Neuron VS is installed. On an OS X Mac, this folder is to be found in the Neuron VS folder in the Hartmann Music directory, itself found in the Application Support folder in your Mac's Library directory. On a Windows XP PC, the Hartmann Music folder is located in the Program Files directory under My Computer (or whatever your PC is called). As on the Mac, the Neuron DB folder is in a sub-directory of the Hartmann Music folder entitled Neuron VS. Even after placing the newly created model folders in the right location, you may find that your new models still don't show up in Neuron VS 's pop-ups — none of mine did. In the end, | solved the problem by physically editing the 'ModelNames' list file that's also in the main Neuron DB folder — after this, my models showed up correctly. This is the file the software uses to reference all of its models, though, so care is required here. Assessing the sound of Neuron VS is not an easy task. It's certainly impressive, and it's certainly big. For me, there is a richness, depth and dangerousness to its sound. Whatever processing is going on in this software feels as if it's on the edge; sometimes, it seems perilously close to being out of control, but often in a good way. This is as much a sound designer's tool as anything, and bizarre soundscapes and otherworldly hits can be easily, if not always predictably, produced. The model selection pop-up menu under Mac OS X. The display is a little different under Windows XP, but you still get access to a huge number of models. As you might expect, subtlety is not an attribute that is often exploited in the factory patch collection, although when it is (as with some of the Rhodes patches), the result is very ear-catching. And amongst the out-of-control models, there are oboes, basses, pan pipes, recorders, bass clarinets, violins, drum kits, and standard synth sounds — although these models are often presented in straight and over-the-top forms, the latter sounding as though the original instrument has been recorded flat-out through a distorting guitar combo. Nevertheless, these 'real-world' models allow you to introduce subtlety when programming, by adding an organic edge to a patch when blended with something more impressionistic or aggressive — and it's this blending of the apparently incongruous, and the ability to shape the result, that offers some of the most fun I had with Neuron VS.
Neuronal sounds can also have a great deal of movement within them, and the options for adding that movement are many (there will be even more when stick automation is enabled). And in addition to what comes built in, you can now add your own sonic material to the mix with the Modelmaker application, turning vocal samples, guitar riffs, drum loops, or whatever you wish into models for Neuron VS to load (see the box above for more details). Being able to harness the complex maths at the heart of this software and apply it to my own samples was a great experience which also allowed me to more objectively judge what the software is capable of. It's not all higher maths, though; careful use of the Resynators and Silver can allow you to think of the signal path in a fairly 'analogue' way. Looking back to SOS 's original review of the Neuron, I note that the original factory patches contained audible loop points that remained from the original samples underlying the models. I can't say I observed this in the Neuron VS patch collection, but samples are certainly at the root of the Neuronic sound-creation process even if (as Hartmann maintain) they are long gone by the time a model is used in Neuron VS. I did hear sample-like artefacts and buzzy loops when playing models in isolation and programming from scratch, although you can still hide these unwanted sonic elements by adjusting the models in the right way. And I would agree that the factory set still uses effects rather a lot to finish a sound off, rather than raw programming; the presets definitely sound better with their effects left on! Generally, though, the factory collection is quite inspiring. If I personally wouldn't use any of the apocalyptic one-finger cinematic backdrop effects, it's only because I'd rather make my own from scratch! A lot of those patches sound a little too similar for my taste, too. But with 351 factory patches, there's still enough variety to be going on with. There isn't a surfeit of bread-and-butter sounds, but given that the Neuron and Neuron VS are clearly aimed at the sound-designing user, that's not going to be too much of a problem. It's also unlikely to be anyone's sole synth. Synthesists with £500 to spare will probably have a collection of other, more standard, sound-making fare. That sort of person is looking for something different — and different is what Neuron VS does. We're talking deep textures and instant soundtracks more than arresting leads or fat basses, although if you wish to explore those avenues yourself, there are results to be had. Neuron VS is perhaps a pointer of things to come; why aren't there more workstation plug-ins out there? Maybe it's down to the CPU and RAM issues, which are certainly a concern with Neuron VS. It's really only viable on a current, top-of-the-range computer if you want to do the plug-in justice and run it alongside digital audio and other plug-ins. That said, the software seems very stable: it never actually crashed a computer I tried it on, even when it overloaded the audio system. The other issue is cost; Neuron VS is pricey compared to other software plug-ins. Nonetheless, if you're aching for access to the dramatic, involving and genuinely different sound that the Neuron offers, but can't stretch to the hardware, Neuron VS offers tremendous savings over the keyboard version, and will feel like a bargain. Genuine Neuron sound at a £3000 saving. 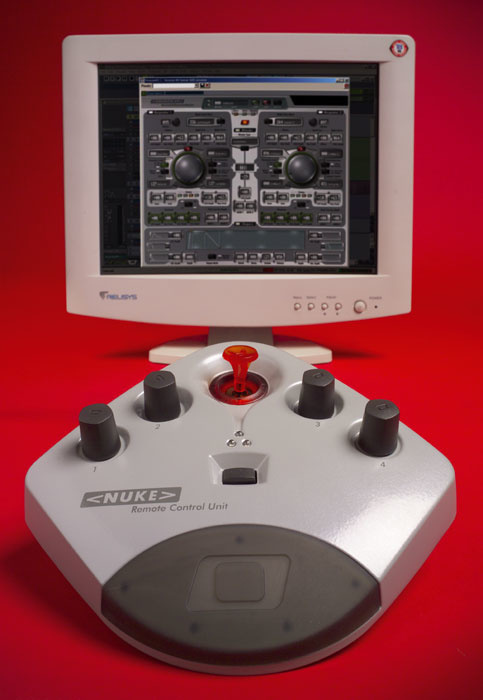 Bundled Nuke controller integrates well with the software. Modelmaker software allows you to add models constructed from your own samples. Still relatively expensive for a plug-in. Very demanding of the host computer. Hartmann use some potentially confusing terminology. Some features not working on initial release. Neuron VS definitely sounds different, and that will be enough to attract many potential users — especially those already excited by the potential of the original Neuron keyboard. However, prospective purchasers of Neuron VS should be aware that they will need a recent, fast, high-specification computer to ensure trouble-free operation.